This is another of my favourite ideas of how to use your home made lemon curd in desserts. I wish I thought of this, but I didn't, Rachel Khoo did, and with the first bite I took, all I knew about Madelines vanished. These cookies are in the Premium League. 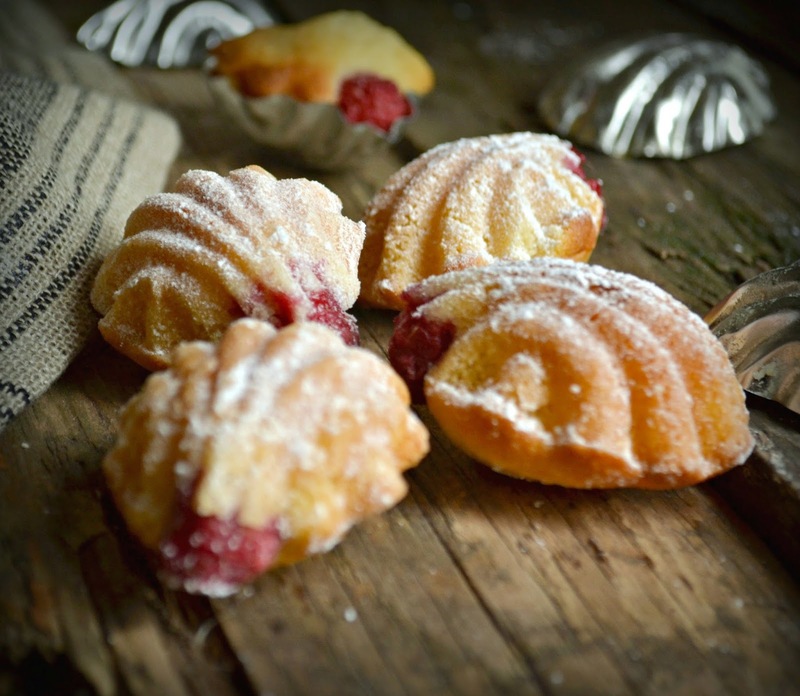 They possess the best Madeleines have to offer plus the added value of sweet raspberries and fresh taste of cold lemon curd. in the flour. Cover and leave to rest in the fridge for a few hours, or overnight, Preheat the oven to 190C/375F/Gas 5. Butter and flour a 12-shell madeleine tin. Put the lemon curd into a piping bag fitted with a small, pointed nozzle and place in the fridge.Put a heaped tablespoon of batter into each madeleine shell and press a raspberry deep into the batter.Bake for five minutes and turn the oven off for one minute (the madeleines will get their signature peaks), then turn the oven on to 160C/325F/Gas 3 and bake for a further five minutes. Transfer the madeleines to a wire rack and leave for a few minutes until cool, then repeat the baking as for the first batch.While the second batch is baking, pop the piping nozzle into the mound in each baked madeleine and squirt in a teaspoon’s worth of lemon curd. Repeat with the second batch, then dust with icing sugar. Although they are best served straight away, comparing to the plain ones, they stay fresh for much longer. Enjoy them now when the raspberries are in season.